51 people were killed and more than 246 wounded as Egyptian security forces clashed with Morsi supporters. The death toll in Sunday’s clashes in Egypt stands at 51 as of late Sunday night, Al Arabiya reports. More than 246 people were wounded during the day as Egyptian security forces clashed with supporters of ousted former President Mohammed Morsi. Supporters of Morsi and his Muslim Brotherhood movement were protesting in several cities to show their displeasure of the military’s overthrow of the former president. The demonstrations took place as thousands took to the streets on the 40th anniversary of the 1973 war with Israel - known as the "Yom Kippur War" by Israelis, and the "October War" by Arabs. Most of those killed had been shot, security sources said, according to Reuters. One eyewitness claimed that military vehicles were firing live rounds at Muslim Brotherhood supporters near Cairo’s Tahrir Square, the news agency reported. 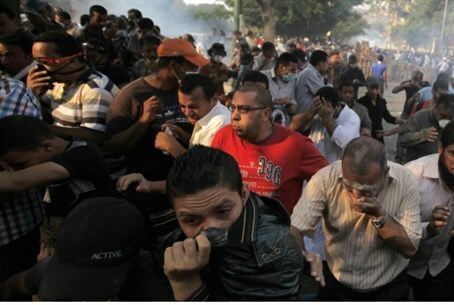 In central Cairo, policemen fired shots and tear gas to disperse stone-throwing protesters. Around 335 protesters have been arrested, a source from the ministry of interior told the Egyptian daily Youm 7. The recent clashes are certain to set back efforts by Egyptian’s fragile transitional government to revive the country’s stagnant economy, particularly the vital tourism sector, and bring order to the streets of Cairo, where crime and chaos have been rife. The Anti-Coup Alliance, the pro-Morsi Islamist group led by the Brotherhood, has repeatedly called for protests against the military's overthrow of Morsi, but its ability to mobilize large crowds has declined as security forces have detained more than 2,000 Islamists including several top Brotherhood leaders. On Friday, at least five people were killed in Cairo, as thousands of Morsi supporters took to the streets nationwide, clashing with security forces.